Self Serve Beer – How Does it Work? There are a few different self-serve beer systems available, but all share many commonalities in how they work. This article explains how self-serve beer taps work from both a technical (but not too technical) perspective and also from a staff and customer viewpoint. If you are looking to purchase a self-serve beer system, this article will help you understand what you will be getting and how it will work. At the location of the self-service tap, you first need an ordinary beer tap just like you’d have on the bar, with a beer line run up from your cool room or cellar. Then there are the additional components needed to enable self-service from the tap. These will usually be a flow controller, a screen, and an RFID card reader. The role each of these plays is described below. All self-serve beer systems need a way of tracking who can access the self-serve taps, and how much beer has been dispensed. This is achieved through an electronic flow controller with a flow meter and valve attached. The flow meter and valve are inserted into the beer line, usually just below the tap. The flow controller takes the readings from the flow meter to track how much beer has been poured and opens the valve when a customer has initiated a dispense. A common method of allowing a customer to activate a tap is with use of an RFID card. When placed on an RFID reader, located at each self-service tap (or bank of taps) the customer identified by the card will be linked to the table and the tap will be enabled. The RFID card can be loaded with funds, which will be deducted when beer is poured from the tap. Or alternatively, spend can be tracked for the customer to pay prior to leaving the venue (a credit card would usually need to be held, or pre-authorisation taken with this method to avoid walkouts). We’re often asked about using a contactless bank card to directly activate a tap. Whilst this sounds like a good idea, it does bypass controls that licensing need to see in place to prevent underage or intoxicated customers getting access to alcohol. This results in additional staff controls being needed, which we wrote more about in our previous article Self Serve Beer – Is it Legal? There will usually be a screen located at the self-service tap that informs the customer what they have poured from the tap (in the UK displaying this to the customer is essential to meet weights & measures requirements). The screen may also inform the customer of the balance they have left on their card or how much they owe. With PourTab self-serve taps the screen is either an iPad or an iPod touch. The iPad tends to work better for a tap based on a table, whereas the iPod touch can be a good option for a tap that is fixed to the wall. One advantage of the iPad is that it can be used to offer additional self-service options such as ordering food or drink from the menu or playing tracks on the jukebox. Behind the bar, there is an activation station, which could also serve as the bar EPOS system. This is connected to another RFID card reader that is used for activating beer cards or loading them with credit. The activation station (or EPOS) is also used to see what has been poured on various cards, and to receive alerts based on volumes dispensed. This enables control of how much beer guests are consuming, which is necessary to satisfy licensing regulations. 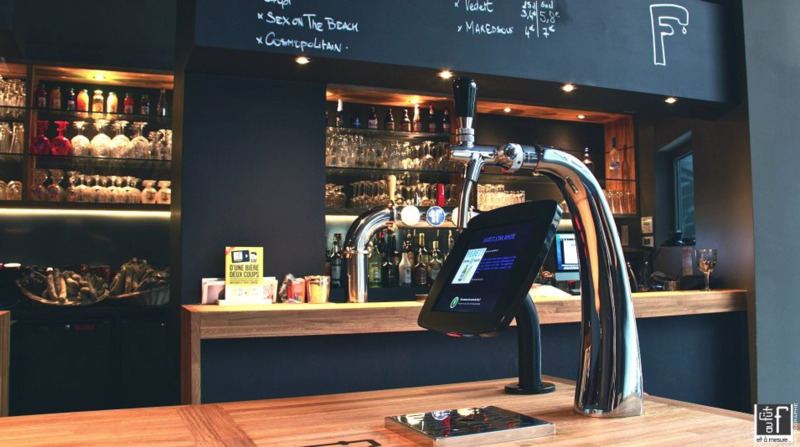 With PourTab self-serve beer taps, the activation station is often a BarTab EPOS iPad that also functions as the main EPOS for the venue. This has the advantage of keeping all sales in one place, whether they take place over the bar in the traditional sense or via one of the self-serve tables. It also avoids the need to have an additional screen behind the bar to manage the self-serve beer system and means staff aren't spending time keying sales from one system into another. In the office, there is a central server that stores all of the sales and allows all of the components described above to communicate with each other. This location will also be the hub of a network (wired and/or wireless) that enables this communication. All of the above components work together to facilitate the customer experience. A first time customer who arrives at the bar will either purchase a preloaded beer card or open a tab that will be tracked by a beer card to be paid later. Staff can create either option on the fly at the activation station or EPOS. The customer then places their card on the RFID reader at their chosen self-serve tap, selects a measure*, and pours their beer. If it’s enabled, the customer might also order some food or other drinks from the touchscreen menu. Depending on how the venue, customers with balances left on cards may be able to take them home and come back to use them again another day. It’s even possible to use a smartphone app to top up their card when they get low on funds. There is of course much more involved in introducing a self-serve beer system, and we wrote about some of the things it is good to think about in our guide to self-service in pubs & bars. If you’re thinking about introducing self-serve beer to your venue and would like to know more, just contact one of our team who will be happy to help.